ETs Among Us? — Who, How and Why? Why are Holistic Doctors Being Killed? Today we face the danger of one-world authoritarian government or any particular religion becoming so powerful that they suppress the natural choice of individuals to freely live their unique experience of spirituality. But we also have the opportunity to create a world where humans experience their spiritual nature as so interconnected with all species and with life itself, that corruption, deprivation and war become faint memories of a bygone era in the evolving consciousness of life on planet Earth and beyond. 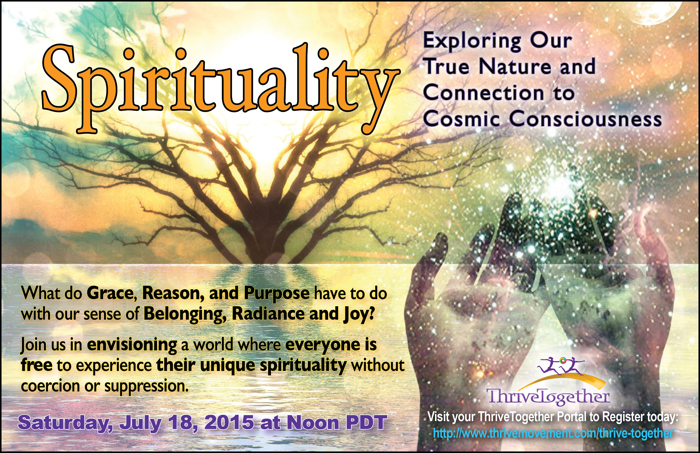 On July 18th at noon PDT we will come together to discuss the power and possibilities of spirituality. We hope you’ll join us. To participate in this event, please register. Once registered, you will receive further instructions by email. You may register at any time now until the event starts. If you are not familiar with WebEx technology, we recommend that you watch this 5 minute tech tour in advance of the event. Have a headset if possible if you intend to interact live — speaker phones can cause echoing. Refer to our Frequently Asked Questions for further assistance. Suggest and vote on others’ questions in the comments below so that we can be as responsive to your considerations as possible. We are eager to interact with you and to benefit from the questions and insights you bring to the table. Not able to attend the event? No problem. You can still suggest a question and then watch the archived version on this page anytime that is convenient for you after the event. An archived version of the event is now available to watch. I would like to recommend Barbara Hand Clow’s work called The Alchemy of Nine Dimensions. I’ve found this to be the best explanation of our multi-dimensional selves, and the relationship of earth to the cosmos, and sacred geometry, and sound and light. I love the Law of One - it has opened me up to so many ideas and possibilities! I was also deeply influenced by Robert Monroe’s Hemisync tapes and books i.e. “Journeys Out of the Body” and “Far Journeys”..etc..My world view expanded and I was emotionally and spiritually impacted. My experience with an OOB exercise I believe increased my ability to travel (rare) interdimensionally.